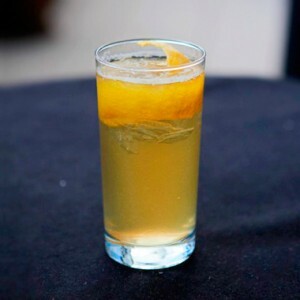 The classic Horse’s Neck cocktail has only two ingredients: bourbon (or rye, or brandy) and ginger ale, stirred in a highball glass and garnished with a long spiral of lemon peel that gives it its name. When you make it with Maker’s Mark and Ale-8-One, it’s called a Kentucky Gentleman. When you make it with spicy ginger beer, you get a Horse’s Neck with a Kick. This version uses Knob Creek bourbon, which makes it even friskier. Add the bourbon, bitters and lemon peel to a highball glass and fill with ice. Top with the ginger beer and jiggle the glass lightly to combine.